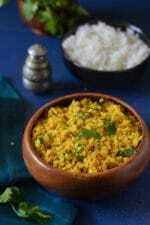 Suva Moong Daal- Yellow lentils cooked with dill leaves – An easy and simple everyday daal . Lentils are a part of daily meal in India as it is a real comfort food of all Indians .We consume a variety of lentils which are grown here and so easily available everywhere.Lentils are a very good source of Protein for vegetarian people,so its good to use a mix of whole and split lentil on regular basis.Though whole lentils are heavy on stomach and can not be consumed often but moong daal and masoor daals are considered as light and easy to digest. 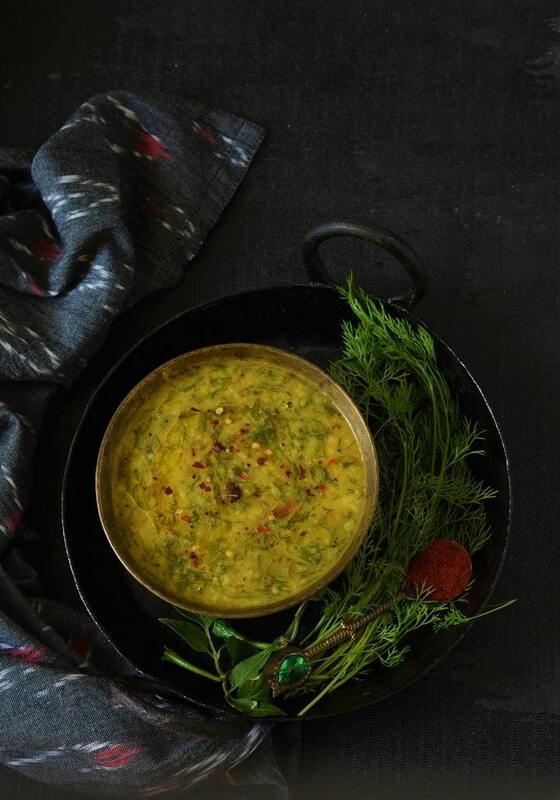 My sons just love this khatti moong daal which is made with Whole moong and curd and Yellow moong daal tadka which in My community call as dhoba moong daal. 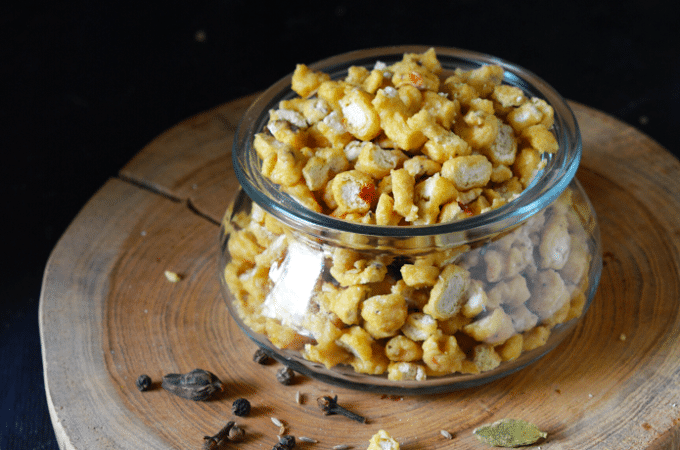 My daughter In Law is from Gujarat so she loves this Gujarati Style – Surati Tuvar daal which is sweet and sour with peanuts, jaggary and kokum added. Dill leaves are very healthy and are very easily available in this season .It has a peculiar smell and taste which either you likes or dislike completely but I like its smell and try to include it in my daily cooking in some or other ways.Dill/ shepu/suwa/suva is good for digestion and help to cure constipation. It have a good amount of calcium so good for bone health and arthritis.Helps to cure diarrhea and dysentery. It is good for oral care as it act as a mouth freshner. It also reduces blood cholesterol level in the body so try including this delicious and healthy green in your diet .Try this Dill and pea pulao recipe which I have posted long back and do try this simple and flavourful suva Moong daal and you will surely like this simple and flavourful daal. 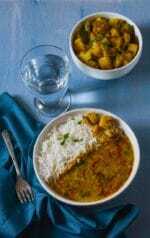 Yellow lentils cooked with dill leaves - An easy and simple everyday daal . Wash and soak moong daal/yellow lentil for 15 minutes. Wash Dill leaves and remove the hard stalk and stems of dill and finely chop the leaves and tender stems. 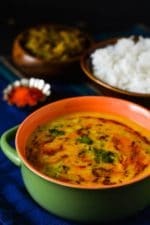 In a pressure cooker or in a pan add the soaked moong daal, 1 tsp oil, chopped dill leaves ,chopped tomato ,green chili, turmeric. Pressure cook for 2 whistles on medium heat or cook till the lentil become soft . When the cooker pressure cool down then open it and give a gentle stir. After adding water,add salt and chopped ginger and cook it for 5 minutes on medium heat. Heat Ghee in a small pan(can also use cooking oil) and add cumin seeds in it. Now remove the pan from the flame and add red chili powder and immediately pour the tempering /tadka over the boiling daal/lentil. 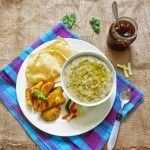 Serve hot with steamed rice,roti or any Indian bread of your choice. 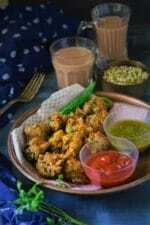 Note- Instead of using ghee you can use cooking oil in the tempering for making it vegan. I love almost all vegetables. But Suva was something that I just couldn’t eat. 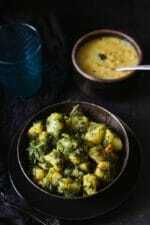 But thanks to your recipes of this dal and aloo Suva sabji… it has become one of my favourite vegetable. My whole family including my little son love these preparations.